This free standing RO system is only 30 inch in height. but it can produce 600 gallons per day of pure water. This system is economical and designed for commercial and residential application. Provide safe, pure water. It is suitable for manufacturing, restaurants, food processing industries, shopping centers, schools and hotels. 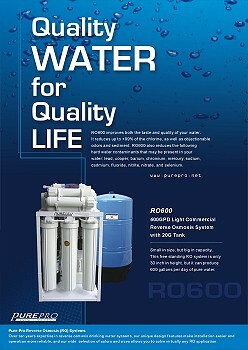 RO600 improves both the taste and quality of your water. 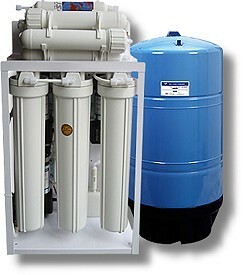 It reduces up to +99% of the chlorine, as well as objectionable odors and sediment. RO600 also reduces the following hard water contaminants that may be present in your water: lead, cooper, barium, chromium, mercury, sodium, cadmium, fluoride, nitrite, nitrate, and selenium. 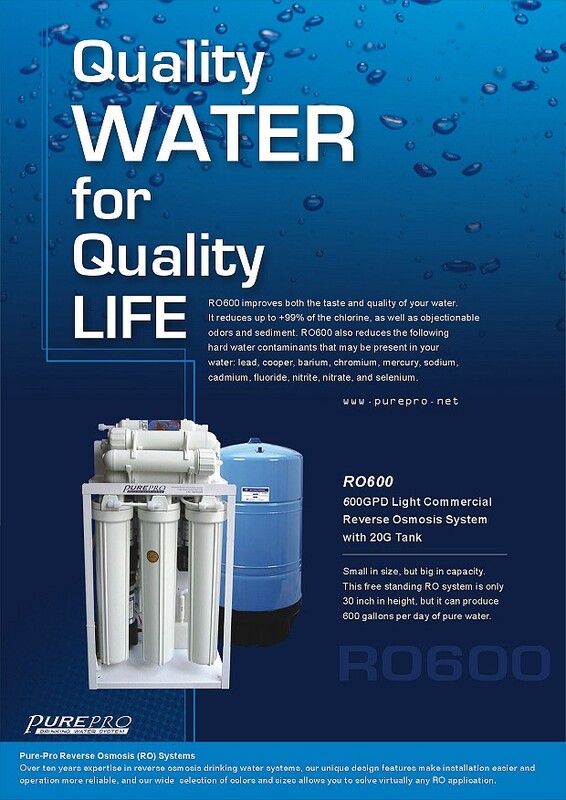 Our RO600 comes complete with a 20 gallons water storage tank and all the necessary fittings, installation kits, 3/8" tubing, and a long-reach chrome faucet. All you need is a few household tools. Installation usually takes less than an hour. 3 high rejection membranes, Each membrane is 200GPD at 100psi. Water Tank (Include) : 20 gallons. 1. 20" length 5 micron Spun-polypropylene Sediment Filter. 2. 20" length Granular Activated Carbon Filter. 3. 20" length Block Carbon Filter. 4. 3 pcs x 200GPD TFC membrane. 5. 12" Inline Post Carbon Filters.